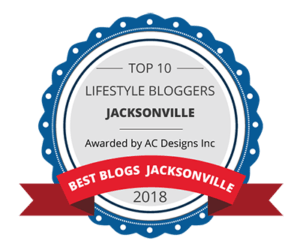 Hi Dolls, I recently had the opportunity to visit the new Embassy Suites by Hilton at St. Augustine Beach and was blown away by how beautiful the grounds were. It is situated on an oceanfront which totally makes for the perfect Florida resort get-away! 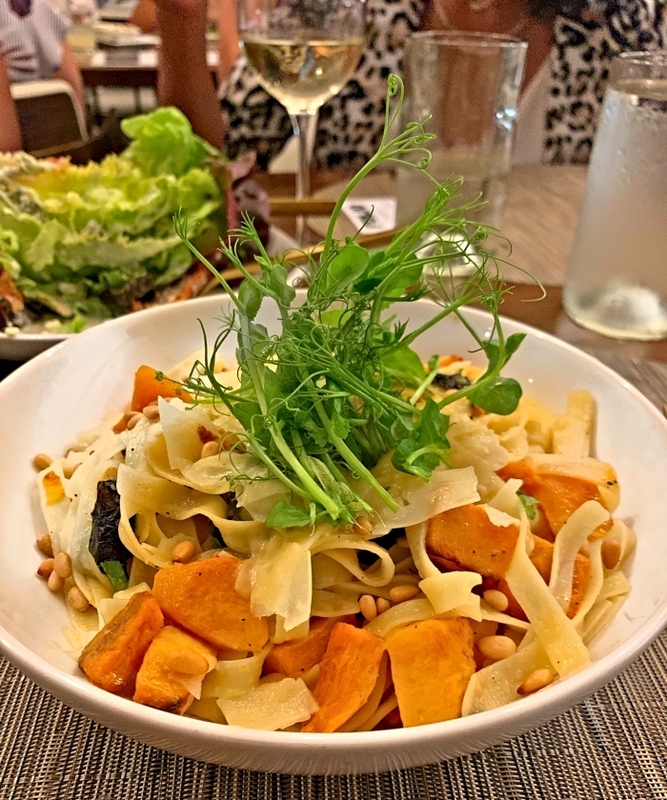 I could go on and on about how gorgeous the new Embassy is but this post is about Harvest & Reel, the signature farm to table restaurant located inside! 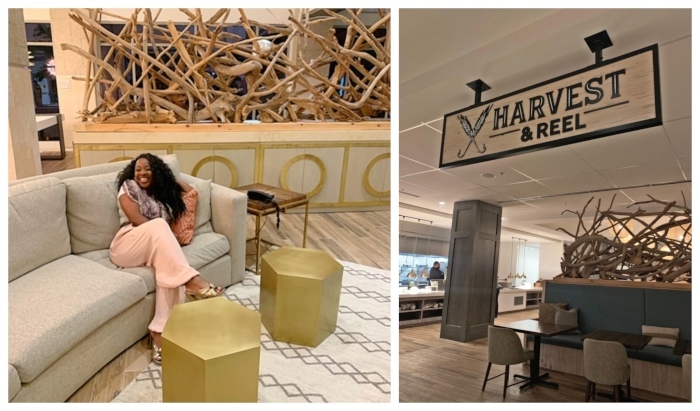 From the decor to the food, Harvest & Reel is the perfect compliment to this fabulous new resort and I was graciously given the opportunity to try several items from their menu! Let’s get right into this food! I’m starting off with my favorite dish of the evening, the Diver Scallops. It had all the flavors complimentary of a lovely Spring dish! 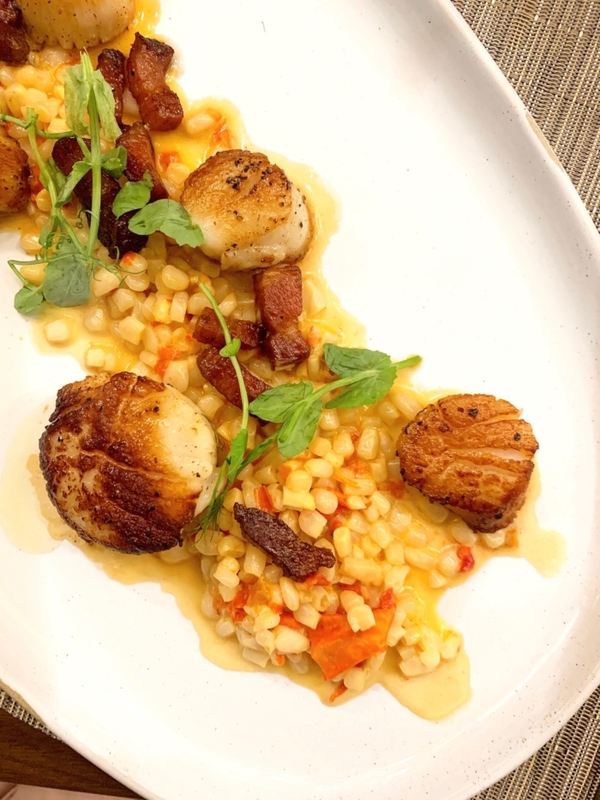 The scallops had the perfect sear and was served with a deliciously light and fresh Corn Maux Choux, celery leaves, and savory bits of bacon lardons. I loved everything about this dish! 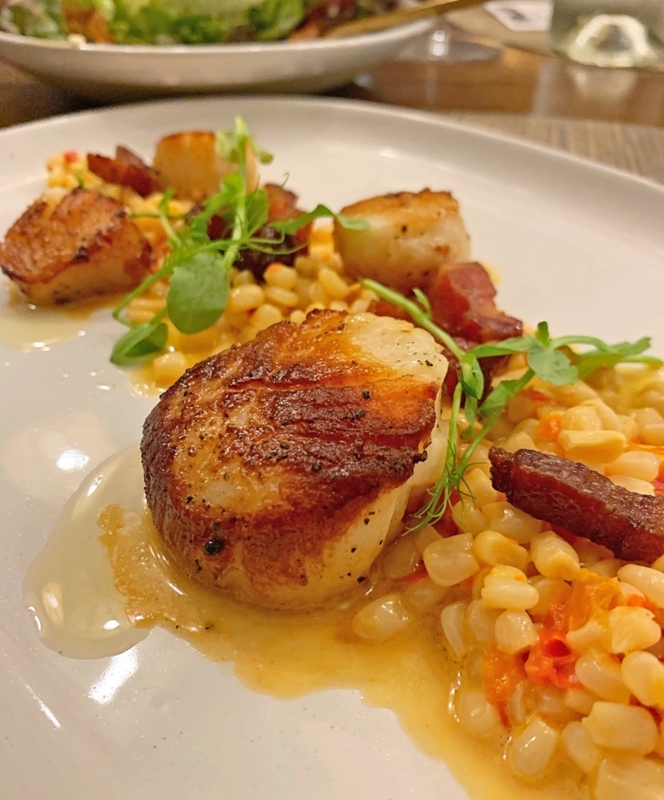 I was so excited to describe the scallops but I’d be remiss if I didn’t include the fact that we tried a variety of shareable dishes for starters. 1.) Warm Artichoke Dip: What I loved most about this dish is that it was served with pretzel bread for dipping! I love pretzel bread so they hit the mark with this one! 2.) Fried Green Tomatoes w/ Dried Cherry Chutney: When in the south, one must have fried green tomatoes! What’s not to love? 3.) 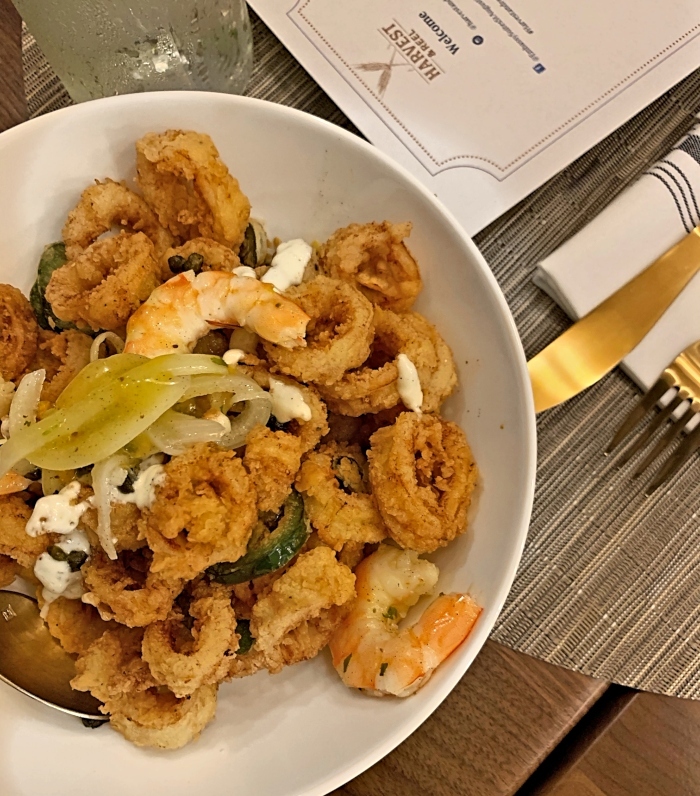 Fried Calamari w/ Pickled Shrimp: I don’t usually care for calamari but this dish was delicious! The texture wasn’t overly chewy and the pickled shrimp added a nice flavor to the dish, overall. I’d definitely order it again! 4.) Tomatoes & Burrata: Served with a variety of colorful tomatoes, Sherry wine vinegar, Lemon Avocado Oil, Sea Salt, and Micro-Greens, it is another perfect dish for the warm spring and summer months. Here’s a closer look at the delicious Fried Calamari and Pickled Shrimp. This dish also included capers, jalepenos, and a Yuzo Aioli. Needless to say, it was packed with flavor! 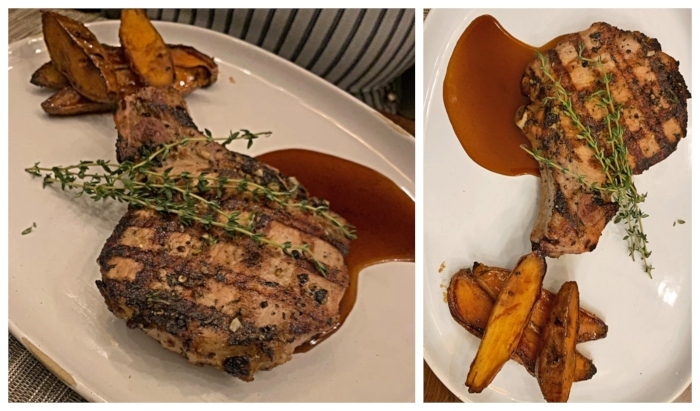 Duroc Pork Chop: I love learning new things about the food I eat. Throughout this food journey of mine, I desire to learn as much as I can about cuisines from all over the world. With that being said, do you know what Duroc means? I didn’t, until I decided to do a little research. Simply put, it is one of the oldest breeds of domestic pigs that have a reddish brown color. 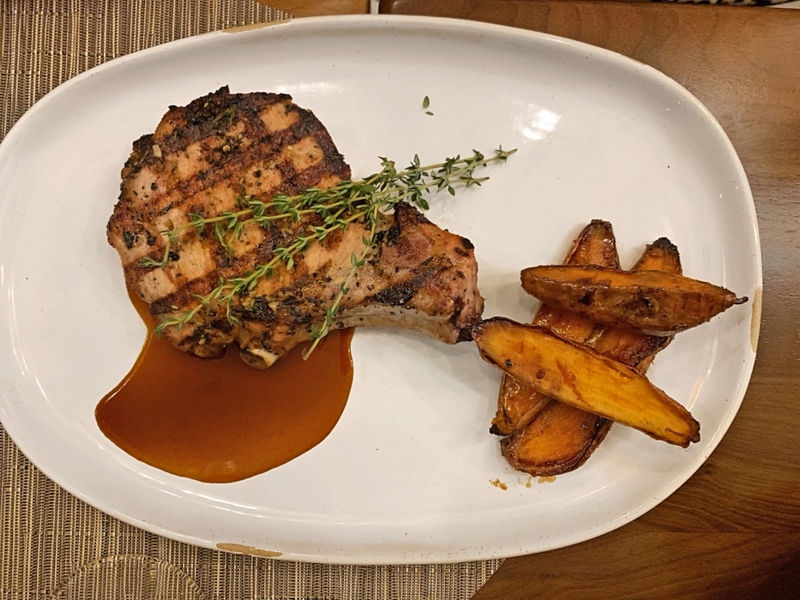 Duroc Pork chops are usually juicier and more flavorful than your average pork chop! They were certainly flavorful and so was the coffee molasses brine and caramel sweet potatoes that accompanied it! I will be ordering this next time I visit Harvest & Reel, for sure! Tagliatelle Pasta: This bright and colorful pasta dish consisted of roasted butternut squash, my fav, Kale, pine nuts, and brown butter. For me, it was a perfectly light addition to dinner but could certainly be enjoyed as a main entree. We enjoyed a few more items including the Bibb Wedge Salad with blue cheese, bacon lardons, and roasted tomatoes, Conch Fritters with a Datil Pepper Remoulade, and Grilled Mahi-Mahi with Fennel & Citrus Slaw and an Herb Polenta Cake, and an assortment of beautiful macarons. Everything tasted as great as described and overall, I am very pleased with this restaurant and look forward to returning! Again, I was completely blown away at how beautiful this resort was. I usually frequent Embassy Suites when I travel so I definitely wouldn’t mind a stay-cation right over on St. Augustine Beach at this gorgeous oceanfront! The Harvest & Reel restaurant did not disappoint. Everything was deliciously prepared and I love when restaurants have open kitchens. If you’re looking for a place to stay on your north Florida vacay, I’d highly recommend staying at the new Embassy Suites by Hilton in St. Augustine. I’m pretty sure you won’t be disappointed with the resort or the food! As always, thanks so much for stopping by! Have a fabulous week! 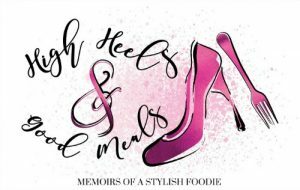 Thank you so much for this review, I love your blog! Thanks so much Tamara! I really appreciate you reading!